I’m back from my blissful vacation on Nantucket Island (above.) I missed all the excitement back home in Maine. A moose went OVER the dam in town. That’s a good 30 foot drop in high rapids down to sharp rocks. 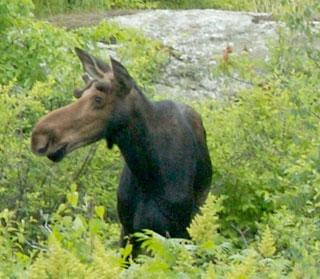 Amazingly the adolescent moose survived the fall and climbed onto an island. He munched some greens before swimming to the bank of the Androscoggin River. The incessant rain in Maine this summer had raised the water level. Lucky moose (photo by Troy R. Bennett for The Times Record.) It was a big story in our local paper. “It’s just one of those moose that’s a year-and-a-half old, and trying to learn to be a moose. He hasn’t really figured it out yet." My woods have only chipmunks, squirrels and birds, but my neighbors had some fun guests. 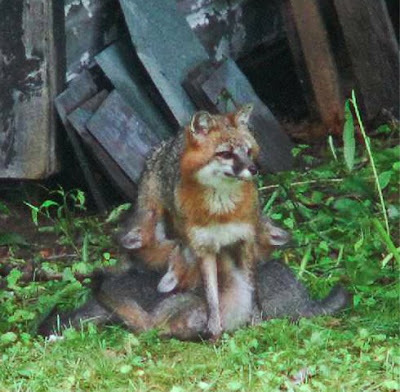 This vixen denned in their woodshed for several weeks while raising her kits (photo by Robert Rand.) We’ve only once spotted a fox in our yard in town. To see wildlife in abundance, you need to drive 2-3 hours north from the coast. The North Woods of Maine have only a few dirt roads, lots of lakes and plenty of black flies. The interior is almost unpopulated and 90% of the entire state is forested. My son is hiking the Appalachian Mountain Trail from central Maine to the peak of Katahdin (tallest mountain in Maine.) It will take three weeks. He’ll turn 15 on the trail. And, no, my son doesn’t have a mistress in Argentina like Governor Stanford. Talking about wild things…. When my son was little, his favorite story was Where the Wild Things Are by Maurice Sendak. It got to the point where I could recite it without looking at anything but the fabulous illustrations. Sleep well and Happy Birthday, wild thing! I saw the preview for Where the Wild Things Are the other night and cried all the way through it! It looks utterly charming. I love that moose. They really do look like Bullwinkle, don't they? I'm so happy this one wasn't injured!! WHAT A POST!!! So glad the young moose survived the fall! Good grief! We used to have moose when we lived in Park City, UT. I miss seeing those gangly-legged creatures. Now, we always have bear wandering through our yard. Wow! Your son has an adventurous spirit. Happy birthday to him! Poor moose and lucky guy too! That vixen is cute. I had no idea Wild Things was made into a movie. Looks pretty good too. We have the book and Jimmy also really liked it. Pamela, I knew you’d be a Wild Thing fan too. Moose are ever so endearing, even if they aren’t thinkers. They can do a lot of harm to themselves and to drivers too. Boomer, I like stories with happy endings. Alyson, welcome back! It’s good to find you back online again. Bears in CT? I had no idea! My son is definitely the explorer type. He collects maps as a hobby. Tina, I saw the trailer before the latest Harry Potter movie. I think the release date is mid October. One to see with our sons? We all read that to our children; now, all of us we'll see it, three generations! And Max said "Be still!" and found that Sendak had illustrated it. He must have begun as an illustrator. The first picture is fascinating! My older daughter loved "Where the Wild Things Are" and read it again and again when she was in kindergarten. I think the book is very liberating; maybe it resonates with something wild deep inside. She loved "the Rainbow Goblins" too. 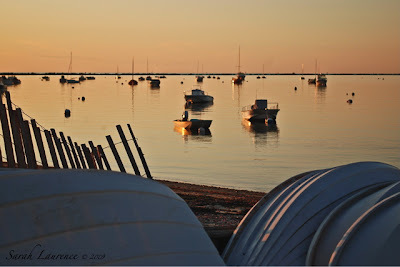 Love the picture of Nantucket--looks so peaceful. My daughter loved the book, Where the Wild Things Are when she was growing up and I believe many children are fans of this book. I hope your son has a great and safe trip and being from the Upstate of South Carolina I wish the govenor would just go away!!!!! We have monsoon condition on this side of the pond too. Climate change I fear. What a lucky moose he was, maybe his bones are still soft and rubbery. I had a fox jump over the front wheel of my bike, like the cow jumping over the moon, last week -it was a wonderful experience. Enjoyed the Appalachian Trail joke. Republicans are so unwittingly funny when caught with their pants down. Tragic tale from the mid-west. Someone had a pomeranian who looked a little like a fox. is a delight on so many levels. I loved this post. It was so full of energy. So, even in the animal kingdom adolescentes get up to mischief, huh? That moose learnt a valuable lesson (hopefully). Many thanks and have a happy summer break. I am already enjoying mine. That's one escapade this young moose can brag about to other moose who've learnt how to be a moose long ago. Ah, the experiences that life has in store! I'm happy for the lucky bloke. He does look bewildered though. All is well that ends well. I've heard the mountains are beautiful, and what a beautiful place to spend one's birthday. I hope he loves his camera, the trails must afford many a scenic moments. 90% of the state forested, what a pretty picture it must cut most places. How funny that a moose made the front page of the local paper--that would certainly make headline news here, too:) Actually, a few years ago there were some wild turkeys running around in nearby Urbana. It was all over the news and stirred up quite a controversy, even making the agenda of the City Council trying to decide what to do about them. It sure beats listening to depressing economic news or the latest from Iraq! Where the Wild Things Are was a favorite of my sons, too. I'm sure they will be taking the grands to see this movie! Fond memory that "Where The Wild Things Are." I knew it almost by heart as well and so did the boys. They became very agitated when I deliberately changed some of the words. One very lucky young moose there as well. What an amazing story about that moose! I'm so glad he survived. I didn't know that "Where the Wild Things Are" was being turned into a movie. I remember reading that book over and over again as a child. I just loved it. Lake, cool about 3 generations! Delwyn, roar! I remember seeing his illustrations in other books too. Sapphire, Nantucket is lovely. You are so right about the liberating aspect of that book. It was interesting to hear that your daughter read it in Japan. I'm trying to imagine how the book would look in kanji. Tracy, sorry about your governor. I wouldn’t find it so funny if I were stuck with him. I’m amazed he hasn’t resigned. Apprentice, wow! A fox jumped over the bike – now that would make a fun picture book. Elizabeth, Republicans do seem to get caught that way an awful lot. Poor pooch. It’s summer – isn’t the point to relax? After my almost back-to-back vacations (hard life!) I’m back at the keyboard. The wet, grey weather in Maine means I’m not too distracted. ACIL, you’d think a big animal would have a bigger brain, but I guess moose expect everyone else to get out of their way, even dams. They are still cute, though. I’m glad to hear you are enjoying your summer break and gladder still that you took time to visit here. Anil, a bragging moose would make a great picture book for kids. Mooscapades? Maybe I'll write it one day. 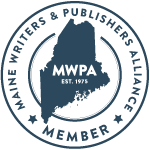 My agent would love if I did one as there aren't too many author/artists. I tried to get my son to bring a disposable camera, but he didn’t want the weight. He did at least bring a journal. Maine is gorgeous. Rose, not too much happens in Maine. We have wild turkeys too – they can be nasty, but I enjoy seeing them. It is nice to read a story without death. I’m hoping my kids won’t say the movie is too childish. I’ll look pretty silly in the audience on my own, but I’ll do it. Troutbirder, ha! You must have kept your boys on their toes. Donna, I love how almost everyone commented on reading Where the Wild Things Are, even outside the USA. It must hold a universal message. I enjoyed rereading the book for this post. It was one of those favorite books that I couldn’t bear to part with even after the kids outgrew it. Two of my favorite things - Nantucket and Where The Wild Things Are. I'm just packing up my books and can't seem to find my copy! I'll have to buy it ASAP. Glad you had a wonderful break, Sarah. Laura, are you moving house as well as blog address? Hello, Just visiting. Your pictures are amazing and I really felt that I was visiting England with you. See you again. I love Nantucket! Thank you for your beautiful photo. Kim, welcome to my blog and thank you! Cynthia, I thought you’d enjoy the Nantucket shot. I can’t imagine the movie being better than the book, but it appears to capture the spirit. Beautiful part of the world. I think the moose must have been in training for the Olympics! Sarah, this post was delightful! You reminded me of my high school dream of backpacking through the Appalachian Trail. I stepped on a rake and had to forgo the trip. My younger sister went in my place- good for her but sad for me.I hope your son has a wonderful, life expanding time. Also, my son loved this book. I read it to him but like you, I have it memorized. I was in a readers theater group in college and we performed it at many schools. It was always a crowd pleaser. Also, I appreciate all of the links you provided. I will go off and check out Cynthia Lord. Do you know Beth Kephart? I'm reading a book she just published, "Nothing but Ghosts". I'm still being a tourist in my own back yard. Have a lovely week. Oh I forgot! That moose is quite a story. It feels like something out of a storybook set in a small town, too. I enjoyed seeing a moose in Ester Park, Colorado many years ago. It made a strong impression on me-I had no idea they were so loud. 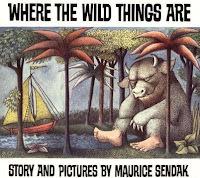 Seeing the trailer for Where The Wild Things Are brought back so many memories of reading the book as a girl and then reading it aloud to both my sons. When they saw the trailer last week they both said, "I remember that book!" with great excitement. I felt it too. I'm SO excited (and a bit nervous) for the Wild Things film to come out. I love that fox photo too! Every blue moon, we'll see a moose here but foxes are a rare sighting. Fabulous photos and what a great adventure for your son. Happy birthday to him! David, Maine moose need an edge on their Canadian counterparts. Phoenix, I hope you do get to go on vacation soon, but your hometown is lovely too. Cynthia, that is so disappointing about your AMT loss. Sounds painful. I’m sure the kids enjoyed your Wild Things recitation. Great idea! Even as a grown up I loved Cynthia Lord’s Rules. I’m looking forward to your review of Beth Kephart’s book. I enjoyed the tour of your hometown. Dawn Maria, I had the same reaction seeing the trailer in the movie theater with my kids. Shauna, we have more fox than moose in this area, but moose are harder to miss when they’re visiting. Sarah, oh your son is amazing! He has such an adventurous heart. I hope he takes lots of photos along the way... and shares them with us. Happy birthday to him! loved that book as a kid, and around your sons age, i spent several weekend on the AT. have never done the Maine sections, but sure he is having a great time. (and learning how to be a moose)congrats on the POTD mention. Welcome back Sarah, what an amazing shot of Nantucket Island. Even more amazing is your son's courage. Wow. Wish him a happy birthday and congratulations on his adventure. How high is Mount Katahdin? What an amazing story about the moose! Congrats on the Post of the Day mention! Where the Wild Things Are was my boys' favorite, too. I still know it by heart. I'm looking forward to the movie, and hoping they do the book justice. I have quite a few moose sightings near my house (Spokane, WA) and never get tired of it. You have a lovely blog. The moosecapade was quite an adventure for the young moose. He will be given high status in moose circles. It seems like all little boys like Where the Wild Things Are. I've introduced it to the 6 yr olds that I tutor. How clever the way you weave your theme! It must be nice to live in a place where a ditzy adolescent moose qualifies as BIG news. That picture from Nantucket looks unbelievably serene. I hope your holiday was just that relaxing! JAPRA, my son inherited the adventurous and artistic genes but sadly has no interest in photography. He did at least bring a journal. Brian, thanks for telling me about the POTD. Congratulations on your win! The Maine sections of the AMT are beautiful and less crowded. Mama Shujaa, Mt. Katahdin’s elevation is 5,268 ft. The base is at 1K ft. It marks the northern end of the AMT. C-M, thanks for telling me about the POTD. The moose deserves the honor. Erin and TechnoBabe, welcome to my blog! I enjoyed visiting your blogs too. Bee, welcome back! That’s so nice to hear that you are sharing the story with other children. My vacation was very relaxing, thank you. I enjoyed the tale of your less than relaxing vacation – what an adventure! FUn to hear and see wildlife... this city girls doesn't ever see things like this! Fifi, I grew up in NYC so you can imagine how much I marvel at all this wildlife in Maine.